At its final monthly meeting in 2016, the Kitson Arts Alliance Advisory Board members and Strategic Partners gathered at The Fireplace Restaurant on on December 14 to discuss the activities, programs, and events it will be focusing on during the year ahead. 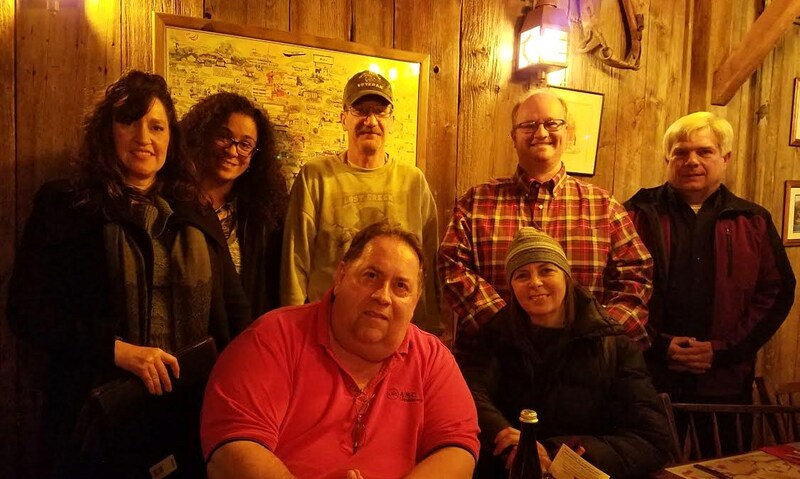 Among those in attendance were (seated, left) Dan Tompkins and Betsy Green (right), (standing, from left) Diana Burridge, Erika Gibson-Bertram, Doug Taylor, Patrick Robinson, and Ken Patton. Also at the meeting but not shown: Gerald Carlin, Tina Carlin, Gary Kaschak, Marta Kovacs-Ruiz, and guests Robin Flak and Rebecca Lesko. In 2016, the arts alliance began researching and touring historic properties in Wyoming County, with an eye toward embracing and maintaining the historic integrity of such a property to create a Community Arts Center and arts alliance headquarters. This pursuit will continue as a top priority in 2017. At the same time, it has also been actively reviewing potential sites that could work to house a new indoor/outdoor “local products” marketplace. This quest will also continue as a priority in the new year. At its January meeting, the arts alliance will be celebrating its first anniversary as it elects its 2017 Advisory Board and updates its growing list of important Strategic Partners. Through its Kitson Art Partners program, the KAA provides exposure for artists by including them in “Local Art on Display” installations throughout our region. In 2016, the organization mounted shows at the Community Cup Coffee & Tea House in Towanda and at the Yearbook Diner and the Blogg Pub & Grill in Tunkhannock. In 2017, the arts alliance will continue to mount shows regularly at these three venues and will be adding an important new venue: the Dietrich Theater in Tunkhannock. The first of the Kitson Art Partners installations at the Dietrich will be “Rock n Roll in Art & Music, ” a show that will include rock-themed displays featuring KAA member artists in all three Dietrich galleries in January, February, and March. A special opening reception will take place at the theater from 2 to 5 pm on Sunday, January 29th. The reception will feature live music by the Sperazza Duo and Bob Zamber, refreshments, and an opportunity to meet some of the installation’s participating artists. Plans are in progress for the arts alliance to present a series of “Bountiful Harvest Farm-to-Table Dinners” once or twice a month in March, April, and May. Beginning in June and continuing in July, August & September, the arts alliance will be presenting monthly fun, relaxing “Firelight Food Truck Roundup” events once a month (3rd Thursday) at the Carlin Farm outside of Meshoppen. These “bring-your-own-lawn-chair” evening gatherings will each feature a handful of our region’s many food trucks, a bonfire, storytelling, and more. Also, musicians of all sorts will be encouraged to bring instruments to participate in impromptu music jams. On Saturday, September 16, 2017, the arts alliance will be presenting its second annual Farmstead Art & Music Festival – a “down on the farm” family-friendly celebration of local art, music, and everything country! The festival will take place from Noon to 6pm on the grounds of the Carlin Farm, a sustainable century family farm (est. 1903) located in the beautiful Endless Mountains at 3064 SR 3005 (Auburn Township), north of Meshoppen, PA. Featured: several local artists displaying their work; live music all day on two stages; a food court offering delicious foods; a variety of vendors featuring handcrafted items, specialty foods, apparel & jewelry, farm & agriculture, home & garden, and so on; and a kids zone offering bounce houses, hayrides, sand art, alpacas, face painting, and pony rides; and a whole lot more. For additional information, visit the Kitson Arts Alliance on Facebook, at www.kitsonartsalliance.org, or send an email to kitsonartsalliance.dan@gmail.com.